If you seek a family friendly day in Santa Cruz, this page will help you find sites and locales that cater to the interests of little ones, school age, and teenage children. 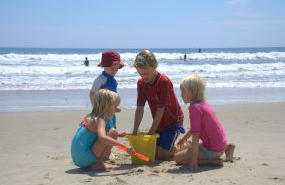 Santa Cruz’ miles of beautiful beaches are an obvious choice for a day of fun filled things to do in Santa Cruz for kids. Bring a picnic to enjoy when you take a break from building sandcastles, flying a kite, or swimming. Visit a state park or consider Half Moon Bay’s recreational area. Do you have children who are constantly asking questions? Who doesn’t, right? Try taking them to a place for which you won’t have the answers. Mystery Spot, located in the redwood forest just outside Santa Cruz, will make you question your understandings of the laws of physics and gravitation. The tickets are $6 in advance, $5 at the door, and children three and under get in free. Visit http://www.mysteryspot.com/ for more details. Your child will marvel at the world’s largest whale skeleton; they will jump at the chance to hold a sea star. The smaller size of the Seymour Marine Discovery Center will keep your child interested while not being overwhelming. Your child is free to explore and learn through the many exhibits, aquariums, and touch tanks. Join in on the daily craft projects offered for children between 1pm and 3pm. If you have older children, consider the Marine Mammal Research “behind the scenes” tour offered on select Thursdays and Sundays. Open Tuesday-Saturday, 10 AM to 5 PM; Sunday, noon to 5 PM. Admission for adults is $6, children ages 4-16 is $4, and senior adults 64 and older is $4. Children three and under admitted free of charge. Visit http://seymourcenter.ucsc.edu/visitor_information.html for tour times and directions. This beautiful beach and bike path along the cliffs is wide and ideal for walking, strolling, biking and skating. Families, surfers, tourists, and wintering monarch butterflies are drawn to this spot. Sit, relax, and take in the breath-taking views of Monterey Bay. Or, watch surfers at Steamer Lane with an historic lighthouse in your view. If you have younger children and are looking for a theme park geared toward the little ones, check out Gilroy Gardens. The park features over forty rides, attractions, educational exhibits, and majestic gardens.You can eat at the park or bring your own snacks and drinks. Be sure to bring lots of water if you visit in the summer time- it gets really hot out there! Call (408) 840-7100 or visit http://www.gilroygardens.org/ for details. While there are many larger, scary ride options, the boardwalk has developed more activities in recent years for younger children. With the beaches and wharf nearby, you’ll have options if the rides or the crowd gets to be too much. For ride information and special events, visit http://www.beachboardwalk.com/. What could be more fun than a beach train? This round trip excursion travels along San Lorenzo River, over a 1909 steel truss bridge, though an 1875 tunnel, and down city streets to the boardwalk of Santa Cruz. Or, opt for the narrow-gauge steam locomotive that operates from Roaring Camp and travels into towering redwood groves, over trestles, and up a winding narrow-gauge grade to the summit of Bear Mountain. Choose from a variety of trains and routes, or visit their site to select a special event weekend. Open from 10 to 5 daily; ticket pricing varies, $8/car to park. Visit http://www.roaringcamp.com/ for event schedules and pricing. If your children are school age, consider a day on the water. Kayak Connection offers daily kayak rentals, kayak tours, wetsuit rental, boogie board rentals, and stand up paddling classes. Featuring guides who double as marine biology students at UCSC, so they’re full of fun facts on marine life. Yelp reviews note that the staff is friendly and patient- perfect for families. Offers exhibits on wetlands animals & history, family activities, bird watching, and more. Exploration walks Sundays at 1:30. Enjoy a tour of educational exhibits, historical archives, and benefit from the agriculture research at the Codiga Center & Museum. While there, schedule a fun hayride, and enjoy an on-site lunch. $2 donation requested per person. During berry picking season, many of the local farms around Santa Criz and Half Moon Bay open their files to the public. Be sure to wear closed-toed shoes as fields maybe messy or muddy. Dress your little ones up in their fall colors for a trip to the pumpkin patch. You’ll not only be able to select the perfect fall pumpkin, you can sneak in a photo shoot when the kids are sporting their natural smiling faces. Some farms also offer hay mazes, petting zoos, pony rides, and haunted houses. From face painting to pumpkin carving contests, the pumpkin festival has a lot to offer the little ones. Be sure to bring your appetite for some pie eating fun!